Weed control is important for two principal reasons. First of all, weeds left unchecked can reduce yield and can lead to problematic weed infestations in the field. Secondly, canola contaminated with weed seeds can be discounted or rejected in the market. For example, canola with greater than five percent wild mustard seed is rejected for pressing. One practice that reduces weed growth in the field is the use of certified, weed-free canola seed. Crop rotation reduces the buildup of high populations of certain weeds common to a particular crop. A rotation results in improved crop yield and crop quality, improved soil conditions, and reduced chances of plant disease and insect infestation. Cleaning planting and harvesting equipment also reduces weed problems. Trifluralin (treflan and others) and sethoxydim (Poast) are currently the only herbicides registered in the United States for use with canola. Apply trifluralin preplant and incorporate for control of annual grasses, redroot, pigweed, and common lambsquarters. It is important to apply trifluralin according to label rates and directions because it can injure seedlings when used at higher rates, or if it is not incorporated properly. Sethoxydim is applied post-emergence for control of annual grasses. White mold or stem rot (Sclerotina sclerotorium ). This can be a serious disease after flowering in seasons with cool, moist growing conditions. Infection occurs when dropped petals come into contact with the stem and spores germinate on the dead petals. Bleached stem lesions occur around the initial infection, then white mold and black fungal bodies grow on the inside and outside of the stem. Sudden wilting and premature death of individual plants are usually the first noticeable symptoms. Since white mold is a problem in several other Michigan crops, its occurrence must be carefully monitored. Avoid planting canola following crops such as soybeans and dry edible beans. Blackleg (Leptosphaeria maculans ). This disease is one of the most important diseases of crucifers (mustard crops). It can be devastating in canola and can be spread through the seed. To avoid the potential spread of the disease in Michigan , use only certified seed that has been treated with a fungicide specific to blackleg control like Benlate. Black spot ( Alternaria brassicae and A. raphani). Alternaria brassicae and A. raphani are generally present in canola and rapeseed production areas in Michigan . Black spot overwinters on plant debris and seed of many different plant species. All aboveground plant parts are susceptible to infection from the spores produced on plant debris or infected seed. To avoid this problem, use certified seed; control weedy canola since black spot can appear on and be propagated by mustard family weeds; and implement a four year rotation if the problem persists. Seed rots, seedling blights and root rots are caused by Fusarim spp., Pythium spp. and Rhizoctonia solani , and these diseases can reduce the plant stand. Seedling rots infect the emerging seedling or expose it to other pathogens. Root rot symptoms appear on the stem bases and on the roots, which weaken or kill the plants. Captan has been found effective to control the seed rot, but it does not protect against seedling blights and root rots. Recommended control practices consist of the use of Captan for seed rot, and rotation to non-host crops. Turnip mosaic yellows (or virus yellow). This virus can be spread by aphids from neighboring sugar beets. Therefore, do not plant canola in sugar beet areas. Insects attack all parts of the canola plant and feed throughout the growing season and directly reduce yield. Certain insects can also transmit diseases directly to plants. Therefore, understanding the relationships between the insect and the crop will enable better pest management. In regions where canola production is well established, numerous insect pests may affect the crop. The following insects are the most likely threats to canola production in Michigan. The flea beetle is the most common pest in an established canola area. Several species of the genus Phyllotreta can damage canola seedlings, with serious damage most prevalent in spring-seeded canola. Significant damage to fall-seeded canola is not as common. The pale striped flea beetle (Systena blanda) may also damage canola. Flea beetles overwinter as adults and emerges in the spring to feed on cruciferous weeds. They move to canola seedlings as soon they emerge. Feeding on the cotyledons of young seedlings can result in reduced vigor and stand loss. Moderate stand loss may not result in yield reduction due to compensatory growth of the canola plant; however, in heavy infestations, complete stand loss can occur. Flea beetle damage is usually limited to the seedling establishment period and is not usually a problem thereafter. If flea beetles continue to cause significant damage after seedling establishment, foliar sprays can be applied. Crop rotation has little effect on flea beetle control as the adults can fly long distances. Planting spring-seeded canola as early as possible may allow a plant to tolerate flea beetle damage better to its increased size at time of attack. Adult cabbage root flies lay eggs in the soil near the base of the plant. When the small (1/16 - to 1/4 - inch) cream colored larvae (maggots) emerge, they may feed extensively on the root system and may also girdle the taproot. Cool wet conditions favor damage by root maggots since slow growth of the plants allows more time for damage. Root maggots are most common in low, wet areas of fields. The larvae (caterpillars) of two lepidopteran pests cause damage to the foliage and sometimes the seed pods of canola. Diamondback moth ( Plutella xylostella) is a pest of canola foilage and seed pods. Adults lay eggs on canola or other wild brassica. When they hatch, the larvae mine into the foliage of the plant; when larger, they emerge to feed on the lower surfaces of leaves. Foliage feeding is of little consequence except under the most extreme cases. Large larvae can, however, reduce yields by feeding on the developing flower and seed pods. Diamondback moth damage is more prevalent in hot and dry conditions. Cabbage butterflies (Pieris rapae) are another pest of canola. These incests also lay eggs on canola foliage where the larvae feed, making holes in leaves. The light green larvae appear velvety and have a faint yellow stripe down their back. Armyworms Armyworms (Pseucfaletia urripuncta and others) can also cause similar problems, by feeding on foilage and pods. Tarnished Plant Bugs or Lygus bugs (Lygus lineolaris ) feed on canola leaves, flowers and pods by piercing them with their mouthparts. Leaf and flower feeding is inconsequential. Damage occurs when the insect feeds on developing seeds within pods. Losses of 10 to 35 percent have been reported in Canada due to seed pod feeding. Damage is considered to be greater on spring-seeded canola. 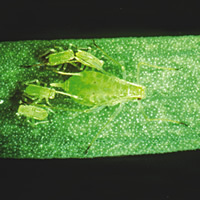 Aphids The most serious damage from aphids occurs when aphid colonies form on fall-planted canola seedlings. Heavy infestations can weaken plants and increase the chance for winterkill. A foliar insecticide may be warranted under these conditions. Grasshoppers are the defoliators that feed on leaves and seed pods. Heavy infestation of these insects can cause the reduction of yield. Other insects Associated with Canola. Canola attracts a wide variety of insects, particularly when in bloom. Honeybees, soldier beetles and wireworm adults are but a few of the insects attracted to feed on the pollen and nectar produced at this time. Carefully identify insects to determine if they actually are damaging the plant or merely visiting. Additional pests of canola, including the cabbage seed pod weevil, red turnip beetle and false chinch bug, may appear in Michigan as the number of acres produced increases. Unknown insects, which are thought to be damaging canola, should be brought to the notice of your local Michigan State University county Agricultural Extension agent .